Tonybet Poker ambassador Isabelle Mercier returns with more tips and advice for playing open-face Chinese poker. Hello all, and welcome to the second part of my own little open-face Chinese poker guide! Last week we ended on the value of scooping and the royalties coming along with it. Today let’s talk more about how much those royalties are worth, as they are such an important part of the game. In Chinese poker, when you fail to respect the order of the lines and foul your hand, you not only have to pay 6 points to your opponent for all three lines and the scoop, but you will also have to pay them for any royalties they might have made in that hand. Needless to say, fouling can really hurt your stack! Another subtlety of the game worth mentioning with regard to scoring is that when we both have the same hand, one of us wins the line but we both can pick up royalties if we’ve earned them. Let’s say we both have a flush in the back, and I win the line with my ace-high flush over your king-high flush. I get that point, but we will both get 4 points in royalties for the flush in the back, no matter how high it is or who wins the line. Once you’ve understood the general rules for OFC, the first step that you have to take to start mastering this game is to know all the applicable royalties on all the lines by heart. For the top line of three cards, the royalties start with a pair of sixes for 1 point, then a pair of sevens is 2 points, a pair of eights is 3 points and so on until you reach trip aces for 22 points. Royalties for the middle line start with 2 points for three of a kind and increase from there, while royalties for the bottom line start with 2 points for a straight and go up as the hands get stronger. 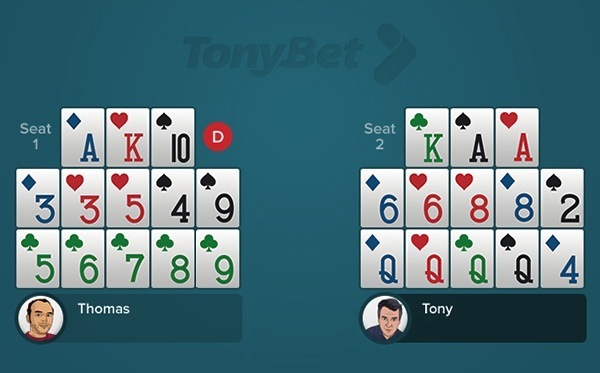 For this hand, Thomas (Seat 1) wins the bottom line against Tony (Seat 2), but loses the two other lines, so Tony wins 1 point. As far as royalties go, Thomas wins 15 points for making a straight flush on the bottom, while Tony wins 10 points for quads in the back plus 9 more points for a pair of aces on top. Overall, Thomas earns 15 points, and there is a total of 20 points for Tony (10+9+1); that adds up to a difference of 5 points in Tony’s favor. OFC can be played at any limit, so for a game at €1 per point, Tony would win €5. At €1,000 per point, Tony would win €5,000 on this hand! As I mentioned in the first part of this little guide, Chinese poker is quite a young game and it’s still evolving. After the discovery of Chinese poker in its original form — the “closed” version in which players set all 13 cards at once — the buzz slowly faded until the arrival of the new “open-face” version of Chinese poker which literally revolutionized the game and assured it a real future. Indeed, something was missing in the closed version. The “gamble” and risk-taking side to the game were close to nonexistent, since it was so rare actually to bust out by fouling while placing the cards. Things are way different in OFC, however, where each player only receives 5 cards to start the hand, must place those (face up, which is why it is called “open-face”), then gets one card at a time and must position each one as it comes on the three lines until all 13 are dealt. However, once a card is positioned in OFC, the players cannot undo this placement and are stuck with this initial choice for the rest of the hand. That presents a significant new challenge when it comes to setting hands, including increasing the chances of fouling. The game is played with a button which moves after every hand, so the one with the button first opens up their 5 cards and places them, then it is on to the next player to do the same. From there each player is dealt one card at a time to be added on the board. If the game is played four-handed, you actually end up using to every single card in the deck, which means calculating your outs becomes super important again, just like in Texas hold’em. And there was the big poker revolution! It was OFC that brought me back to the Aviation Club de France poker tables a few years back, playing all night long, placing cards, counting outs, busting, winning big bonuses, watching my stack making swings in every direction, and not even noticing the time go by. I remember one particular night at the ACF — it was a weeknight, and it must have been 2 or 3 in the morning. My OFC game was going to break soon. There were three players still in action, but the third one left the game, leaving me alone with David Benyamine. Whom I adore, obviously — he’s a very good friend, but he is also an amazing player who dominates every game he plays! Wow — playing for playing, playing just for the fun of it! I promise you this game is that fascinating. This Benyamine poker monster gave me tons of advice during our “free” game, while repeating over and over “not to tell the others” — LOL! Thanks David, I had a blast! Try the game right now by downloading Tonybet Poker and using the bonus code NOMERCY to receive 100% bonus up to €500 and a free ticket for a weekly Pineapple NoMercy Ride tournament! 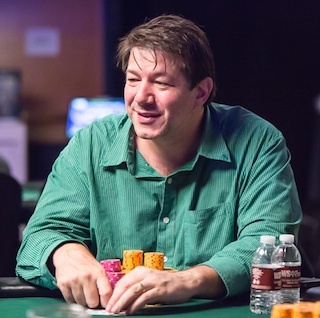 Want to stay atop all the latest in the poker world? If so, make sure to get PokerNews updates on your social media outlets. Follow us on Twitter and find us on both Facebook and Google+! Ran into kings twice to bust the doublestack at Cherokee. If anyone is driving to Asheville tomorrow I could sure use a ride. 2 episodes in — zero of what makes the show great.